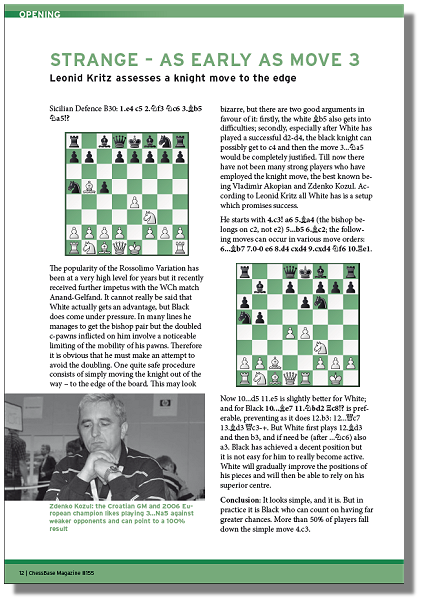 ChessBase Magazine le cuesta menos que un buen libro de ajedrez. Pero tiene más material de alta calidad porque la elite del ajedrez escribe para nosotros, de Anand a Yusupov. Para resumirlo, usted solo recibe lo mejor: autores de primera fila, las últimas partidas, vividos reportajes, entrevistas exclusivas. Y por último, pero no de menor importancia, una excelente oportunidad para acercar la fascinación del mundo del ajedrez a aquellos que no son entusiastas… aún. ChessBase Magazine consta tanto de un DVD como de una revista impresa que tiene periodicidad bimensual. 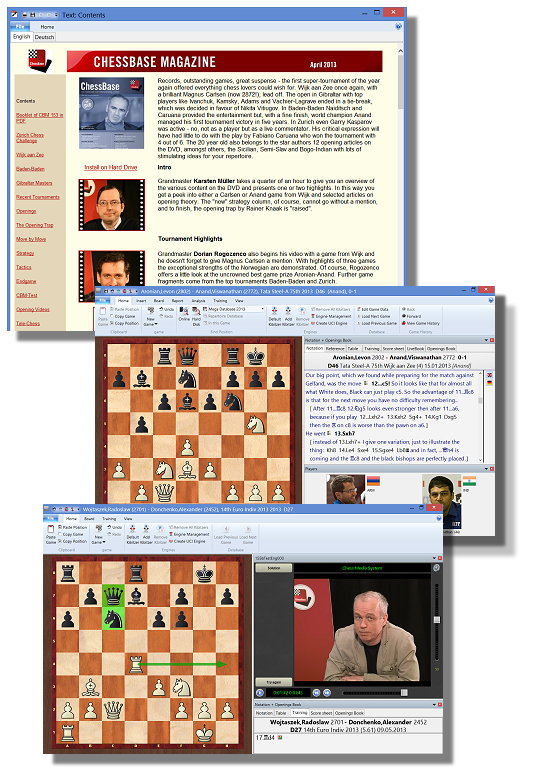 Many annotated games as well as videos in Fritztrainer format from top players such as Anand, Carlsen, Kramnik, Caruana, Aronian, Gelfand, Karjakin, Kamksy, Radjabov and Shirov. In every issue 11 to 15 opening reports from top class authors. What is really essential about every subject is explained in compact form. The opening surveys consist of an introduction and several annotated games in which the authors treat the subject in a way which is both of a high level and yet user-friendly. Tactics: Bundesliga player Oliver Reeh selects nice tactical exercises from the latest tournaments and you can see how you measure up against the clock. In addition, on a video the author offers you a deeper insight into the way combinations arise and how to find them. Strategy: GM Dorian Rogozenco explains the baic ideas of a strategical motif in a video and provides a traning database on the subject with several training tasks. Endgames: Hamburg Grandmaster Karsten Müller is acclaimed worldwide as one of the greatest experts in the endgame. In his contributions he analyses the most interesting endgames of the previous two months and demonstrates in video format the most beautiful endings. The opening trap: Editor in chief and Grandmaster Rainer Knaak presents a subtle opening trap in every issue. And the best of all: You save on the ready cash. The ChessBase Magazine subscription costs approx. 20% less than buying the individual issues. The spectator is drawn actively into the training process, i.e. he or she is challenged to reply to a training question by entering the move which is the solution. It is only when that has been done that the training continues. There is feedback for every move entered, either in the form of a confirmation or in the form of a challenge to have another try. And if you have only found the second best move, there is frequently some comment about your idea. One of the first authors to make use of this new format to help you in your work is Daniel King. For his “Move by Move” column, the English player always prepares a complete game for training purposes. 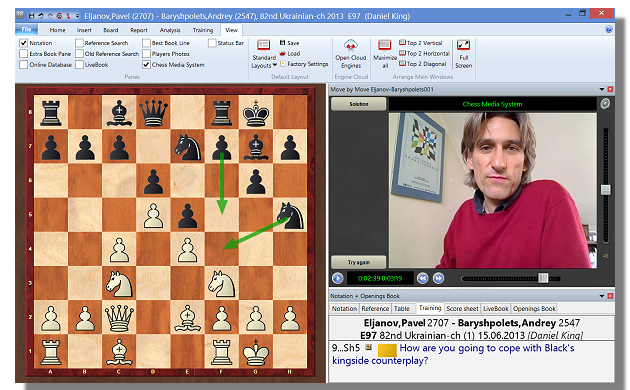 In ChessBase Magazine #155 it is the King’s Indian game Eljanov-Baryshpolets (Kiev 2013) which is up for discussion. The trainee always has to put himself or herself in the position of the winner and find the latter’s moves. King’s trademark: instead of only dealing with the best move, a lot of plausible alternatives are also explained, sometimes including wrong moves. It is also nice to find one of the variant moves – you then learn why the move you have chosen is not so strong, thus widening your chess horizons more than by simply finding the move in the game. In addition you still have the chance to get the right answer by clicking on “Try again”. Now it's up to you to find the right moves! Enjoy the new video training format with GM Daniel King and IM Oiver Reeh! Free opening survey - download a sample! With the line 3...Na5 the German GM Leonid Kritz presents you a repertoire idea against the popular Rossolimo Variation. With this strange knight move Black avoids the doubling of his c-pawns. White also has to waste time because his Bb5 is not optimally placed. In the ideal case, Black can later move his Na5 to c4. How should White react to the bizarre knight move? What are the practical prospects for Black in this line? * Duración 12 meses; la suscripción se renueva automáticamente por un año más si usted no comunica su deseo de cancelarla con una anticipación mínima de 1 mes a la fecha de finalización del periodo de referencia. ** ¡Bono solo para nuevos suscriptores! Recibirá el código del vale por correo electrónico, directamente tras haber encargado la suscripción. *** El precio especial para la base de datos Mega sólo es válido para quienes hayan comenzado la suscripción antes del 1 de septiembre. Las suscripciones posteriores a esa fecha podrán optar al precio especial con la edición de la base de datos Mega del año siguiente. GM Adrian Mikhalchishin: "I like CBM in different ways - as a reader, I prefer the Endgame Corner by Karsten Mueller - really well done. As a trainer, I use CBM Tactics to warm up my pupils, sometimes Opening Surveys, which are useful for certain openings and sometimes Strategy, the subjects of which are always instructive." GM Teimour Radjabov: "I have been using CBM for a long time and it is very useful, because you can see all the recent games, annotated by the best players in the world." Tata Steel 2019 with analyses by Anish Giri, Vishy Anand, Vidit, Peter Svidler etc. Yannick Pelletier, Erwin l'Ami and Mihail Marin present selected games in video format. Plus 11 opening articles with new repertoire ideas, e.g. Dutch with 2.Bg5!? NEW: CBM Extra now comes with a "Lucky bag"! Peter Heine Nielsen comments on the WCh deciding games. Plus video training with Christian Bauer and Yannick Pelletier, and 53,900 new games for your database! La actualidad en formato digital. Lo más importante de la actualidad ajedrecistica de los últimos meses en su ordenador. Teoría y práctica.